Alan Gilbert’s traversal of Nielsen’s six symphonies concludes with this pairing. I’ve already reviewed the previous instalments - Nos. 1 and 4 and Nos. 2 and 3 - and while I found things to admire in the latter, I was much less complimentary about the former. My colleague Jack Lawson went so far as to declare Gilbert’s Second and Third ‘one of the finest CDs ever produced … period’ (review); he was slightly less enthusiastic about Nos. 1 and 4, where he commented on the orchestra’s corporate character and lamented the lack of risk-taking (review). The 21st-century NYP do indeed play with a refinement that, while admirable in itself, doesn’t always serve this music so well. Mr Lawson invokes the spirit of Leonard Bernstein, whose Nielsen recordings for Sony/CBS in the 1960s sound as fresh and febrile now as they did then. Rather mischievously I’ve chosen Lenny’s Fifth – with the flamboyant, old-style NYP – as my comparative version; there are other fine accounts from the likes of Jukka-Pekka Saraste, Ole Schmidt and Michael Schønwandt, but I’d be sorely tempted to take Bernstein’s to my desert island. Listening to it in preparation for this review I was forcefully reminded why this is such a classic; Lenny heightens the work’s mood swings to thrilling effect and the performance itself arcs and crackles like no other. Even the recording is good for its age; it’s broad and beefy, although the strings are apt to glare and there’s some break-up in the climaxes. One of the hallmarks of Gilbert’s Nielsen cycle is the generally fine engineering – one expects nothing less from Dacapo – but a full Avery Fisher Hall can sound rather dry. In terms of performance Gilbert doesn’t make the start of this Fifth palpitate with barely concealed emotion in the way that Bernstein does; clearly one goes for the head, the other for the heart. These modern players major in clarity and discipline; nothing illustrates this more tellingly than the snare drum – Shostakovich, anyone? – which has little of the nerve-jangling intensity that one hears from Bernstein's team. Gilbert is just too manicured in Nielsen’s manic moments; he doesn’t screw up the tension nearly as effectively or as consistently as Lenny does; indeed, the latter transfixes listeners with his increasingly impassioned progress. That’s not to say he’s rushed or garbled, just that he gives the music a strong – albeit extreme – character and sense of purpose. That said, Bernstein doesn’t have it all his own way, for if Gilbert prefers a longer fuse in the first movement the pyrotechnics in the second are as spectacular and as intimidating as any. The downside is that it feels too much like opportunistic overload; iimpressive in iteslf it's curiously disconnected from what's gone before. I've noticed this fitful tendency in the other recordings in the cycle, and it's most distracting. Now here’s the thing; the NYP are no less assured for Bernstein, and yet they have a distinct character and flair that's missing under Gilbert. No doubt that has much to do with their unique, often turbulent, relationship with Lenny. There’s a spontaneity, a give-and-take, in their recordings from the 1950s and 1960s that I just don’t hear today. Bernstein’s detractors will offer the standard riposte, that those vintage performances are more about the man than the music; perhaps, but I’d much rather hear this repertoire delivered with expressive elasticity than with the po-faced precision heard here. In fact it doesn’t have to be either/or, since Schmidt, Schønwandt et al play this music comparatively straight without undermining its volatile temperament. 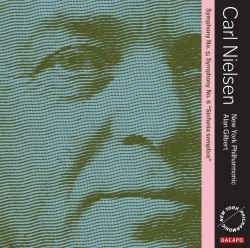 Nielsen’s strangely oblique Sixth Symphony is well served by Schønwandt, who clearly relishes the score’s Ivesian collisions and quirky juxtapositions. Saraste and Schmidt have their strengths too, but it’s the latter who has the best grasp of the symphony’s challenging architecture. Gilbert certainly articulates the gurglesome start to the Sixth very well, and the rest of the Tempo giusto is crisply done. The trouble is that I find myself listening to the orchestra rather than the music, and that’s hardly ideal in this ever-shifting musical landscape. True, the woodwind playing in those chamber-like dialogues is ravishing and the rude interjections are startling, but beyond that there's little to sustain one's interest. The crucial timps in the Humoreske are more dominant than they would be in the concert hall, but then that applies to Schønwandt as well. However, when it comes to interpretive insights the latter is much to be preferred; indeed, the rougher Danes drill straight down to the symphony’s subtext, whereas their super-svelte American counterparts barely scratch the surface. That said, the silky NYP strings at the start of the Proposta seria are a joy to hear, as is the level of detail and timbral sophistication captured by the Dacapo engineers. Make no mistake, though, the rival versions Iisted above aren't that far behind in terms of sound; what they might lack in sheer amplitude they more than make uo for in conviction and coherence. If you’re looking for shadows here – for things that go bump in the night – then you’ll be disappointed, for Gilbert plays the Tema con variazioni with the lights blazing. It’s left to Schønwandt to make the most of the score’s spectral episodes; he also handles the dark waltz far more convincingly than Gilbert does. Ditto those hammering intrusions, which ought to be far more terrifying than Gilbert allows. Even Osmo Vänskä, who recorded the work in 1999 as part of his underrated BIS cycle, finds far more incident and atmosphere in the finale. The big-boned recording is terrific – listen to that bass drum – and the BBC Scottish Symphony play with gusto throughout. I’m always happy to celebrate exemplary musicianship and top-notch sonics, both of which are present here in abundance, but without that all-important intellectual/emotional connection such excellence doesn’t count for much. Taken in toto Gilbert’s recorded Nielsen is just too calculated for my tastes, and it doesn’t begin to challenge the best in the catalogue. Still, it’s a beautifully presented package that's sure to appeal more to others than it does to me. The sound and the fury, signifying very little; old rivals still hold sway. The 5.0 surround track has an unfortunate fault. The right and centre channels are reversed. This completely throws an otherwise fine recording because the sound field collapses to the left. If the user can easily reverse the R and C leads then the sound picture is excellent.